The work of Chinese director Zhang Yimou first came to prominence in the late ‘80s/early ‘90s with arthouse releases of films like Red Sorghum, Ju Dou and Raise the Red Lantern. With his latest movie, The Great Wall, he’s in entirely different territory, namely main street multiplexes and IMAX screens. It’s a giant leap from his earlier work to this cast-of-thousands extravaganza but it still bears Zhang’s hallmark eye for visual flair and use of colour. Granted, he has approached this area before in films he made in the noughties, like Hero and House of Flying Daggers, but this one has raised things to another level altogether. The Great Wall tells the story of William (Matt Damon), an English mercenary, and his mate Tovar (Pedro Pascal), the last survivors of a group of 11th century European fortune-hunters venturing to the East in search of the fabled ‘black powder’, gunpowder. As they approach the Great Wall they’re attacked by an unseen ‘monster’ but manage to escape, taking a severed leg as a trophy. Soon after they are captured by soldiers of The Nameless Order, a special division of the Chinese Imperial army awaiting an attack by the tao tie, monsters that storm the wall every 60 years. Recognising the limb as being from a tao tie, the Chinese laud the pair as brave fighters and they join the soldiers on the wall to combat the marauders… but secretly they hatch a plan to escape with some ‘black powder’ while the battle rages. An international crew brought The Great Wall to fruition and it really is a multi-national collaboration. US and Chinese producers, a Chinese director, a DOP from New Zealand, Stuart Dryburgh, a German composer, Ramin Djawadi, an American production designer, John Myre, a Mexican costume designer, Mayes C. Rubeo, special effects by NZ company Weta, and well-known Chinese, American and Chilean actors, have successfully joined forces to bring this fable to the screen. 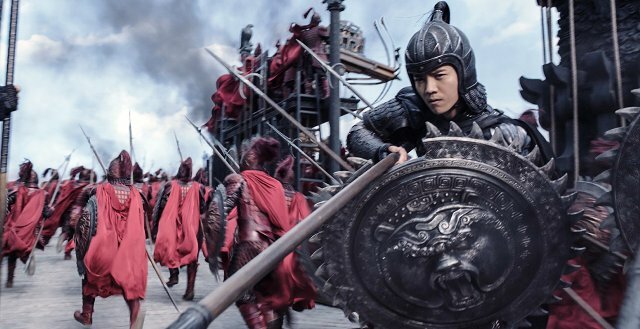 Collectively, they’ve achieved what it seems they set out to do - make a diverting fantasy drama that’s as loopy as Matt Damon’s weird accent but as visually arresting and entertaining as Zhang’s early work.